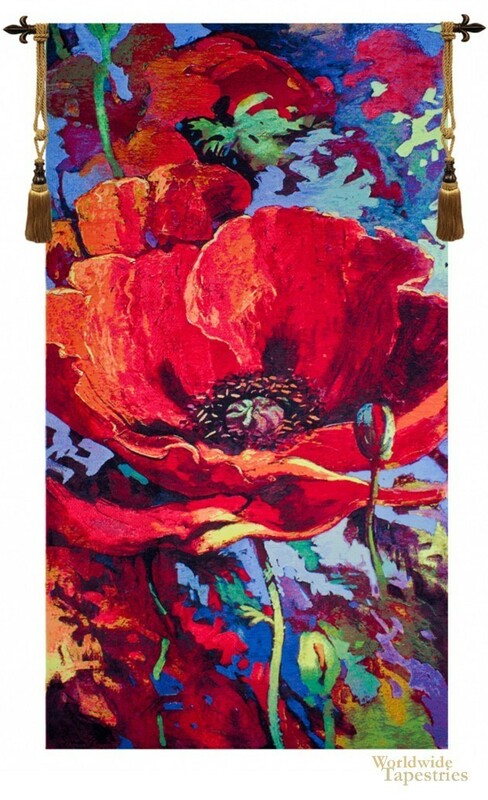 Based on the work of British Born Simon Bull, this tapestry Awakening shows a poppy in sumptuous style. Here we see the poppy in all its glory, as if rising from a scene of abstract color and flowers. The pure beauty of the petals of the poppy is portrayed perfectly in its play of light and shade in this piece which is an example of the beauty of his works. Bull's works have an immediate impact on viewers and it is easy to see why. His use of color and composition is most beautiful and striking, making it most evocative and engaging. Here the poppy's petals and its deeply colored stamen contrasts beautifully in color and pattern. This modern floral tapestry Awakening - Simon Bull, is backed with a lining and a tunnel for easy hanging. Note: tapestry rods and tassels, where pictured, are not included in the price. Dimensions: W 36" x H 66"